Walter Harding, from a photograph in the Walter Harding Collection. 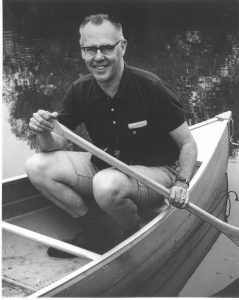 Walter Harding (1917-1996) was one of the leading Thoreau scholars of the 20th century. Harding received his B.S. from Bridgewater State College (1939), his M.A. from the University of Chapel Hill (1947) and his Ph.D. from Rutgers University (1950). The majority of his academic career was spent at the State University of New York-Geneseo where he taught from 1956 until his retirement in 1982. The collection of Thoreauviana built by the late Professor Harding consists of first editions and manuscripts, thousands of articles and pamphlets, art, records, microfilm and extensive correspondence from leading Thoreau scholars. It is recognized as the world’s most comprehensive research collection on Henry D. Thoreau. 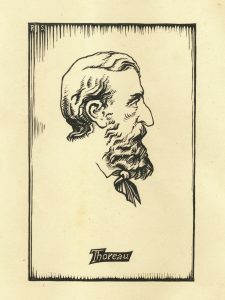 Thoreau from a bas-relief by Walton Ricketson, used by Walter Harding as a bookplate.